Of all of the places to fish in New Zealand, the region around Lake Taupo and the town of Turangi offers the most spectacular choice of fishing experiences, for the adept, the enthusiast or the novice fly fisher. Pit your skills against the slashing, super-fit rainbows of the winter spawning run, or stalk the mighty 10lb browns that lurk among the willows on the lower Tongariro River, famed as one of the finest, high-yielding and most consistent trout rivers in the world. Explore the smaller rivers and streams of the region that hold fresh-run fish in surprising numbers; even brooks you can cross in a few strides harbour trout of remarkable size, condition and ferocity. Venture into the remote ‘back country’, where you may never see another human being all day and, amid the scenic grandeur of the New Zealand wilderness, come to grips with fish in true wild rivers whose memories will enthral you for years to come. Test your mettle and your endurance against massive trophy fish in clear green lakes flanked by a majestic backdrop of active volcanoes capped with snow – a breathtaking setting that irresistibly draws the world’s best and keenest fly fishers, year after year. 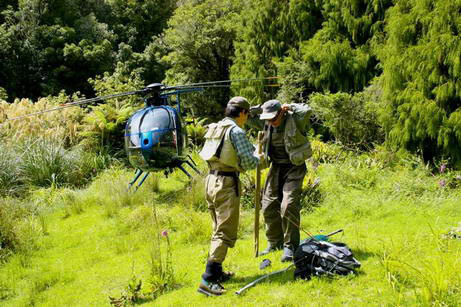 Whatever your level of fly-fishing skill or experience, fishing Lake Taupo and fishing Turangi offer a river, stream or a lake to suit you perfectly, well stocked with large, hard-fighting fish. If you’ve sampled the best that fly fishing has to offer in the Americas, Europe or Australia, there are still secrets to win and pleasures to be gleaned from fly fishing Taupo region – from the spectacular summer cicada hatch that drives the big brown trout wild, to the express train of the rainbow spawning runs in winter, to the bone-jarring strike of a heavy lake trout on a delicately retrieved nymph. If you’ve dreamed of fly fishing all your life but never held a fly rod or wet a line, Taupo trout fishing offers the perfect way to start. There’s lots of open water for easy casting and every good fall of rain summons runs of fresh fish, in prime condition, up the rivers. Ken has given many anglers, male and female, young and old, fit or a bit creaky, the lifelong joy of landing their first trout on a fly. Nymph and wet fly fishing on Taupo rivers for hard-fighting rainbows and occasional huge browns. Dry fly: when the fly is made to resemble a natural adult insect and cast delicately so it rides on the surface of the water, in the presence of feeding fish. The art is to present it closely and naturally enough to invite their attention, without ‘spooking’ them. Wet fly: a fly tied to resemble a small minnow or natural water insect, fished close to the bottom or to weedbeds and retrieved in a way that makes it appear alive, provoking the hungry trout into seizing it. Nymph: a fly tied to resemble the larval stage of the life-cycle of day-flies (ephemoptera). Nymphs emerge from under submerged stones, logs and weed early in the day before rising to the surface, shedding their coat and becoming adult insects that mate, lay eggs and die by the evening. The nymph is fished down the river current, close to the bottom where feeding trout lie, or around weed beds in lakes. Sight fishing: when you observe your quarry feeding, approach them with stealth and care and try to present the carefully chosen dry fly or nymph in such a way that it appears part of their natural diet and the trout takes it without ado. This is the most exciting and exacting form of the art of fly fishing.